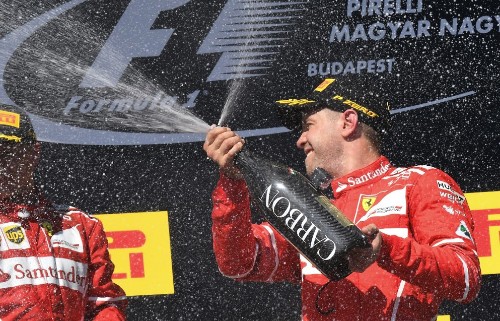 Sebastian VETTEL: I'm over the moon. I mean it was a really difficult race, maybe it didn't look like but I had my hands full from three or four laps after the safety car. There was something wrong, I don't know why the steering started to go sideways and it seemed to get worse. Then I stayed off the kerbs, tried to save the car. It wasn't easy. I didn't do a favour to Kimi who obviously could go faster. I didn't have the pace. But then towards the end it did come back a bit. I had a couple of laps where I had a bit of a cushion and I could breathe a bit. But yeah, I really had to stay focused the whole race. I was hoping for a couple of laps to breathe but they didn't come, so really tough. But great result, great day. Thank you for the support. There was a guy out of the chicane, every single lap he was thumbs up, thumbs up and keeping us going, so it was really great. Q: So you had one eye on the fans and one eye on the steering? Vettel: And one eye on the steering, because it wasn't straight. Q: Can you explain that? Can you explain what can give you that? Vettel: I don't know, we'll have a look, but to be honest it doesn't matter now, we won the race. It was a weird feeling because basically it was tilted to the left so you go down the straights and the steering isn't straight and then in right-handers it's sort of OK, but in left-handers you have to get used to it. After a couple of laps it's OK but if it's changing all the time it's difficult because you have to further than you want and than you think in your head. Not ideal, but as I said, it doesn't matter. A big thank you to the team, it was a great race. Kimi RAIKKONEN: Oh, I think they all understand English. Obviously great support, unfortunately I couldn't give them the win. We had a one-two as a team, so I had a great car today, but obviously when you... I had a mistake yesterday in qualifying. I got a good start but I didn't want to force the issue and obviously after that just kept following the 71 laps. Not ideal, obviously I want to win, but it's great for the team. Raikkonen: Yeah, the other guy has to do quite a big mistake or have some issue. It's not easy to overtake and especially with team-mates you take more care. But at least they are still happy - that's the main thing. Q: Valtteri, we saw a very sporting gesture from you, at the request of your team, to move over for your team-mate. You must have thought towards the end that he as not going to be able to give that place back because of all the traffic and because of Verstappen hunting you down. What are your thoughts on this great sporting gesture? Valtteri BOTTAS: For sure in the end I was getting a little bit worried as the gap was increasing. I really struggled with the backmarkers today and was a little bit unlucky also with those. But really, thanks to Lewis to keep the promise and let me by in the end, because I gave him the shot to try and get past the Ferraris. It's a shame, we had good pace in the end today but with the starting position we couldn't finish any better. Just want to say thanks for all the support this weekend. It's been really cool to drive here with all this support and Finnish flags. Q: Did you doubt at any point whether the team would make the call on Lewis given that you are in the championship battle, absolutely, but given that he is the lead driver? Did you have any moment of doubt or absolute trust in the team? Bottas: Well, for sure when the gap was big I knew it could be a problem but in the end I just want to thank the team. Q: So, Sebastian, 14-point lead, that's a nice way to go into the summer break? Vettel: I don't mind; it's OK. It could be worse! Q: What are your plans for this break from Formula One. You're notorious for being a hard worker, are you going to be at the factory simulator or are you really taking time out? Vettel: Well we have a test here in a couple of days, but after that to be honest no big plans, I just want to enjoy the time at home. We spend so much time on the road travelling and I know you have a family as well, so you know how it is, so it's nice just to have a couple of days at home and rest and enjoy that. Q: Sebastian that's win number 46, your fourth of the season but it didn't look like it was one of your easiest. When did the problems with the car first materialise? Vettel: Well, it was a tough one. I was hoping for a bit more quiet afternoon. I had a very good pace and I think Kimi had a good pace, so I think he could go a lot faster than me for the majority of the race. I don't know, I felt already that there was something not right when we dropped the car on the grid. Now, driving the car to the grid was fine but then for the formation lap when we dropped that the steering wheel was not straight and then... well, I did the start and then there was a safety car and then during the opening laps I felt that it wasn't right but it didn't impact too much because it was only small. Then it did get worse and towards the end of the stint it started to ramp up and gradually get worse. It was more and more difficult. Simply... I think after this race I am quite certain there is a reason why the steering wheel is straight and not shifted to one side. Because it's very tricky - left-handers to right-handers and then if it keeps changing to adapt. I did try to adapt and I obviously knew that we can't change it. Then I tried to save the car, also we spoke a little bit on the radio about it. I was talking through the problem and they told me to avoid the kerbs, which I was doing already, but on a track where you use the kerbs nearly on every corner it's obviously also compromising your performance. In the second stint then I just wanted to make sure that I've got enough tyres with whatever problem I might face, so just towards the end of the race I'd have enough tyres. So of course I was holding it back a little bit. It's not like I had an awful lot more pace. Also, in the end I was really going flat out and obviously they were all behind me, queuing and it's good that you can't overtake that easily around this track but I had no room for error. It was a tricky race, with the lapped cars not the easiest to go through. As I said, there was no room to the cars behind. It was difficult but the mindset that I had half way through the race was "it doesn't matter. I can't change it now - I'd love to but can't. We keep going and just try to hang in there as much as possible." The race felt very, very long. Every lap I was looking down; it didn't end. The last couple of laps I was able to find a bit of a rhythm, opened a bit of a gap, which helped me to take the very last bit of the race a bit easier through the traffic and controlled the race to the end. The result is great. How we got there was very tense but very happy, obviously great result for the team. Q: Kimi, how do you feel after that one? You've said that you had a very good car, do you think you had the pace to win this grand prix? Raikkonen: Yeah, definitely. But obviously... I had a pretty decent start, our starts were pretty similar but obviously I get the tow effect and braked slightly later but obviously I'm not going to force the issue in the first corner. We're going to fight, but we're going to fight fair. Since that moment there is not an awful lot you can do. I had a very good car today, like it was yesterday, but obviously my mistake didn't help. The biggest chance was in the start and then took it quite easily at the beginning and my car was handling well and I was closing up. We were pretty on the safe side in the first stint because we pull away from Mercedes and then I catch up with Sebastian again in the end of the first stint but once he went in I had very good speed, I could have stayed longer out. I guess there are reasons - maybe the Mercedes they stopped earlier and they fresh tyres so... Anyhow, the whole race, basically, following Sebastian and hoping that he goes as fast as he can but not saving tyres because then there was a Mercedes catching me. Once you are in the middle it's a bit awkward place, because if you get a bad exit in the last corner or something the guy behind you with the DRS might get you with a good run but actually maybe once when I got a little bit sideways. I must say the car was great today. I was just, basically, following my own rear wing, same looking at least. Obviously I want to win but great for the team. Q: Valtteri, I guess it was an afternoon of damage limitation for Mercedes? It seemed to be just a tense, difficult race for the team. Radio problems etcetera, just talk us through it. Bottas: Yeah, unfortunately we couldn't really gain any positions today. First of all the start was quite average so I couldn't really attack in Turn One. The initial bit of the start was OK but then I had bad upshift from first to second gear so I lost a bit of momentum and after it was tricky. In the beginning Ferrari seemed to be just really strong with the supersoft but then when we went to the soft, with the issues of Sebastian, everything started to be a bit more interesting. We were struggling with radio communications - sometimes they couldn't really speak to me. I don't know what was the issue - but anyways, I was trying to get close enough to Kimi at some point to attack but there was no opportunities, and then we swapped, as a team, and Lewis tried it as well. When he was trying, at the same time I really struggled with the backmarkers. I felt that I was really unlucky with a few of the guys, being behind them for full laps and losing time, losing the rhythm but then the team promised me that once we did the swap and I let him go and try that, that we would swap again back, if he couldn't make it. And he couldn't make it and the team kept the promise, which I'm really, really happy about and really thankful for the team that we swapped again at the end. Big thanks to Lewis as well because I don't think every team-mate would have done the swap back. If you're running for a podium place - so I think that was nice from the team and nice from Lewis. But unfortunately, damage limitation. Q: (Flavio Vanetti - Corriere della Sera) Question to both Ferrari drivers. Can you tell me how did you deal with the situation, especially from the mental point of view, having such big pressure from Mercedes behind - was it one of the toughest tasks of your career? Vettel: Well, I didn't have a Mercedes behind me so it was quite... I saw obviously that Valtteri was closing in. I didn't know about the Lewis swap and stuff but yeah, I was very busy driving to be honest and trying to keep it on the track without using the kerbs, which wasn't easy. I saw that Kimi sometimes got closer, sometimes not. At some point I think they were asking how much faster I can go. I knew that Kimi doesn't feel comfortable because he was a lot faster. I know that I wasn't very quick, so not a great position, as he said, to be in the middle for him but for me obviously it was good because I had Kimi and then, let's say, other people, so it was OK. In the end it's not so easy to pass here. I still had some pace - I don't think I was completely off the pace, which obviously helped. But not an easy on, as I touched on before. Q: And Kimi, that pressure from Mercedes? Raikkonen: I was really not too worried. Obviously I talk with the team in the radio but I was not too worried because my car was handling so well. Even though I was very close, the whole race, to Sebastian, my car was still very good and no issue with the tyres. I could follow very well through the last corners. I had only one... two times a small issue in the second-last corner and then in the last corner pushed a bit too much, really the only time my car snapped, even once. But it wasn't ideal, obviously, because I felt I had speed and I was stuck in the middle because then it's always... we know how fast they can be on the straights sometimes, Mercedes. I also felt pretty comfortable because my car was so good that I didn't really... once there was traffic or something and I dropped a little bit back, I could just speed up and make the gap before the last few corners. So, that was just... to know what we were going to do because I could have slowed down in the first part and speed up in the last part. It helped me a bit. Not a big worry. Q:(Tomasz Kubiak - SwiatWyscigow) Question to Sebastian. You said you wanted to answer the critique which came after the last race. Would you say now that it's a job done? Vettel: I didn't say that. I don't remember. Maybe I have a bad memory. What I said I think, what I meant is that there's always a lot of talk and it's good to move on and get to the next race and then the talking usually stops. I think it's normal, based on what you did last race. People say something good or say something bad. I think something that has always worked for me is that you're never as good as they say, and you're never as bad as they say, so... yeah, if the Silverstone race was the worst race of the year, then that's fine, we move on. But it's a long year, a lot of races, normal to have some ups and downs. It was a nice race here. Really enjoyed it. Obviously yesterday was great, today was a bit more difficult but the result in the end matters and that's what makes us very happy, obviously, that's what the team deserves. I think they are working very hard. Again, you mustn't forget where we were last year, the end of last year, and the step that Ferrari has made is bigger than anyone else. That is easily forgotten when you are fighting, challenging - but there's a lot of things that the team can be proud about, and they can be proud of themselves, so I'm very, very happy. I think we're both very happy where we are with the car. The car felt good today and the whole weekend overall. So, yeah, it's been a good day. Q: (Peter Vamosi - Vas Nepe) Question to both Finnish drivers. Are you interested in a day competing in the Race of Champions as Team Finland? Mostly the question is for Kimi as you had opportunities with testing Peugeot at World Endurance Racing, NASCAR, whatever, so you have really tried out many cars. And Valtteri, what are you interested in more; to compete in Race of Champions or Stars and Cars? Raikkonen: I've been asked to be there many times but I always said that once they go back to how it started with rally cars and then the proper circuit with the two lines, with the gravel and asphalt, I'll be in - but before that, forget it. It's not... it's a show, that's it. Q: (Livio Oricchio - GloboEsporte) To Sebastian. Sebastian you know Ferrari history of team orders and giving privilege to one driver. Could you comment please on Mercedes having one driver that is your main driver that is your main competitor for the world title asking to him, give this place back to Bottas? Q: (Ysef Harding) This is for Kimi and Valtteri: after speaking with a number of Finnish fans last night who were very passionate about you guys, and finding out that saunas are a thing in Finland, they asked me to ask you guys what you plan to do for the break and how will you celebrate being on the podium today? Raikkonen: Obviously we have the test on Wednesday so from that point there's not an awful lot of plans. The biggest plan is to be with the family; obviously we have some time and spend time with them. We have to travel an awful lot so it's great to have some freedom now. Bottas: We'll be testing here on Tuesday but then we'll go back home to Finland. We'll go to the sauna and have a beer. That's my plan. Q: (Luis Vasconcelos - Formula Press) We are in a unique situation in which the three podium finishers don't have a contract for next year as far as we know. Is this going to be a priority for the next four weeks or are you happy to sort it out later in the season? Vettel: I think there's a bit more time to talk about these things but I'm also quite keen to find out how long Valtteri lasts in the sauna and what type of beer he is drinking, so I'm waiting for an invite. Raikkonen: No different than any year. It's not really my decision. For the team knows what is my preferred option and then see what happens. Bottas: Yeah, for sure soon we will start to... we need to speak (about) what's going to happen, obviously. I have no idea about the future yet so for sure we will speak at some point but the problem is that the mobile phone is not so good in the sauna. It doesn't work so it could take a while so don't expect anything in Spa. Q: (Jerome Pugmire - Associated Press) Sebastian: you said just now we mustn't forget where we were last year. Ferrari's made a bigger step than anybody else; a 14 point lead with nine races left. Could you have ever imagined being in this position at the start of the season or is this beyond what you would have dreamt of? Vettel: No, it's what I dream about to be honest. I want to win so that's where you want to be. I don't have very precise dreams in terms of gaps, points and stuff like that. I think I'm more basic on my dreams as long as I remember; most of the time I forget but yeah, I think all in all, the mission has been to get back to the top so obviously we had a great year, I'm only two and a half years in with the team. I think we had a great year in '15 which helped to get the project going. '16 was difficult, I think, for many reasons but I think it was a great year to set things up, a lot of change for the team but yeah, over the winter I think we were the team that made the least noise. There was a lot of talk about the new cars and the new regs and how it will favour one team over the other and how it will bring back other teams and so on. I was very happy that we just worked, we just kept to ourselves and did the job. We have a great car. We know, I think, by now with a lot of races done, what the strength of the car is, where the weaknesses are, that's where we need to work on. For sure you cannot expect it to change overnight but yeah, I'm very confident the group of people... We have a lot of people that you maybe don't know because from the outside people try to identify a team with one person in terms of who is the driver or obviously it's easy because there are only two but in terms of who is designing the car, it very often ends up with one... you point the finger at one person. It's not fair. The team is very big and there's a lot of people so we have a lot of great people, young people coming up and a great culture, people taking risks and that's what we need to do. We want to win so very happy where we are going but it's not yet enough. Today's great, we got a one-two but that's what we want every weekend. We haven't done it so far, I know it's difficult but it's not impossible so we keep working. Q: (Peter Farkas - Auto Motor) Kimi and Sebastian, the Mercedes guys seem to think that now it's clear that the balance of power between the two teams is track-specific so as you were very quick in Monaco and then the Hungaroring, two very twisty tracks and at Silverstone they were quicker; do you agree with that, that's it's track specific and if so what do you think will be particularly strong tracks for Ferrari until the end of the season? Vettel: I find it's a bit difficult... I mean you have very little time during the weekend to change things so I think it's normal that some tracks are more in your favour, also from a driving point of view. You mustn't forget that we are all different so some things we maybe prefer at some tracks over other tracks and it's not always the same. It doesn't mean that (because) you won the year before that you are always great on this track, you know. Maybe over a couple of years you can draw other tendencies but yeah, overall, I know we have a very strong car, we have a car that is competitive everywhere. We have had circuits on which it was less competitive. If you want to point out Silverstone, we weren't quick enough to win, that's a fact but we weren't horrible. It's not like we were tenth and eleventh on the grid so we still qualified well. We outqualified one of them on Saturday so I think we are at the right track, but it's normal that some tracks maybe you struggle a bit more, some a bit less, then you can draw conclusions of the car which might not be wrong, so it's fair to say that we were very competitive here and Monaco; Mercedes was less so but equally if you pick the races out, it wasn't like we were miles ahead and lapping them so... It also depends how your race goes. I think the most important thing is that we were always there so far, we always had good pace so I don't think there's anything to be afraid of in the next couple of races. Q: Kimi, you have a great record at Spa; do you think Ferrari can challenge Mercedes there? Raikkonen: For sure there are some circuits that fit us better because there are areas that we have to improve, probably especially for qualifying, the Mercedes has better horsepower but it depends on so many things. It's not just purely that you look at the layout of the circuit - ah this is going to be good for us and this is going to be... The tyres... We can't have it which conditions there are going to be and a lot of small things which will make a difference. Let's have a holiday first and see what happens at Spa but obviously if you purely look now, you would say it's not going to be as easy for us as here but obviously we try to improve and we are going to do our best. Q: (Zsolt Godina - F1vilag) Kimi, do you feel that you could have done a better job with the strategy with the pit stop with a possible longer first stint to win this race? Raikkonen: I wondered it but obviously I had no idea what was happening behind us when Mercedes stopped before us and then Valtteri went a lot faster with the fresh tyres so the team asked me to come in. I had good speed on the in lap so I wanted to stay longer but I have to trust what the team is telling me and obviously they see the big picture so... We got close but it's OK.